Frank Glynn with Tom Jennings and John O'Donnell, part of the crew who are repairing the riverside walk in Milltown. The weather may be changing but local politics remains much the same and if someone applied for planning permission in the middle of the Clare River they’d still get support from vote-hungry councillors. This is according to Milltown community activist Frank Glynn, a former chairman of Galway Co Council, who told the Herald that if people wanted to attribute blame for flooding they might want to look closer to home. He said that it was lucky sealing work had been carried out on Milltown bridge in the 1990s or the whole structure, built in 1856, could have been washed away, cutting off the N17. This is an example of forward planning but there was a lot of bad planning to counter it. 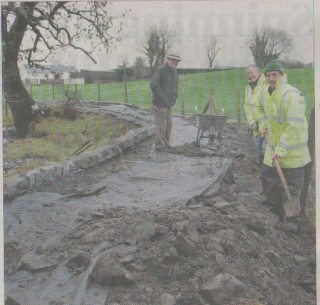 He made his comments as workers were getting down to repairing the footpaths on Milltown’s award-winning river walk. Much of the recently laid gravel on the path was washed away in the recent flooding which breached the village’s mill race and flooded the thatched heritage cottage to a depth of 2.5 feet. He said they would be hoping for some emergency funding to carry out repairs and were planning to replace recently planted Beech hedging with more hardy Hazel which has roots that withstand submersion. “Mind you, we can’t blame this on the government. When I was in the Co Council if someone wanted planning permission we would Section 4 it and push it through. Most engineers were fine with this despite warnings of flood plains and all that. Then farmers insisted on building wherever they liked and couldn’t be persuaded to move somewhere safer,” Frank said. He added that he knew from his association with the building trade that not a lot had changed in recent years. “It’s hard to apportion blame, it’s like a patchwork quilt with lots of people responsible for a bit of it but we can’t fool ourselves by saying we weren’t warned or we had insisted on careful planning. Frank’s views are echoed by planning consultant Diarmuid O Grada who this week said Co Councils had a duty of care when allowing planning and had to recognise that septic tanks simply couldn’t operate under water. He argued that the Minister for the Environment needs to take a strong stand against lobbying and political patronage when it comes to planning, especially in rural areas, and called for a ban on what he termed “random rural houses”.